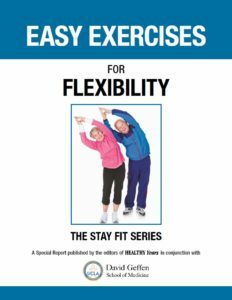 For the next few minutes, try to forget everything you’ve heard about flexibility. Suspend any preconceived notions about stretching, warming up, joint range of motion, and preventing injuries. Tags aerobic fitness, aging, back pain, bone, cardiovascular, cardiovascular disease, diabetes, exercise, exercise program, falls in older adults, fatigued, fitness, fitness program, health, heart attack, heart attacks, heel pain, hip joint, inactivity, inflammation, joint health, low back pain, massage, mobility, multiple sclerosis, muscle, muscle soreness, muscle spasms, muscle tension, muscles and joints, muscular strength, myofascial release, nutrients, pain, pain in the back, physical activity, physical fitness, posture, recovery, relieve pain, severe pain, strength, strength training, stress, stroke.